Ribbons for one pair of pointe shoes. Pink nylon 1" (2.5cm) wide x 39.5" (100cm). Capulet Juliet d3o pointe shoes. High tech design for comfort and performance. 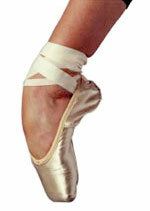 Last up to 20 times longer than traditional pointe shoes. Wear Moi hand made pointe shoes have a streamlined box and flexible side wings for comfort. The back rises higher at the heel ensuring that the shoe does not slip off.